I've seen a few signs of Spring in the garden, a few bulbs peeking through the soil and little green buds on shrubs and trees.... there's hope of Spring to come! 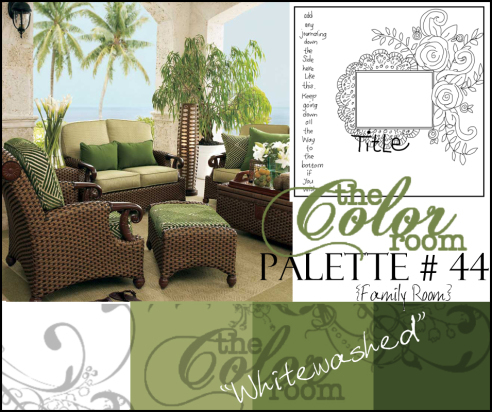 I used The Color Room Palette #44 "Whitewashed" and the CRC44 sketch. I love the pretty sketch and gorgeous palette. 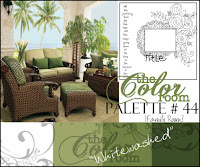 I uploaded my card to the Color Room last night but didn't get a chance to do a blog post! 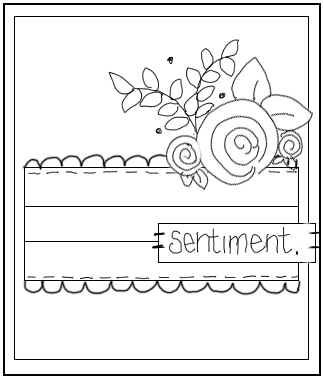 There's a new color palette and sketch today. 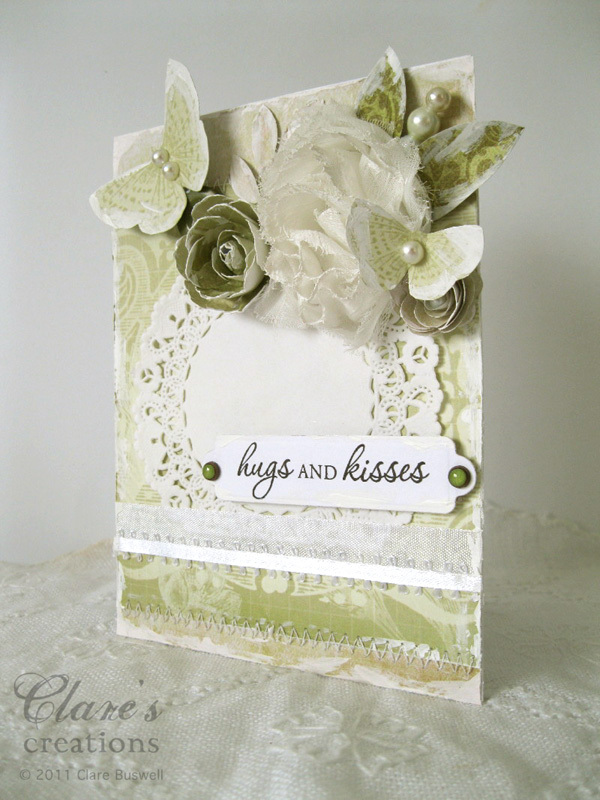 The papers are from the Mariposa Stack DCWV, I cut out the butterfly and made the little green flower using the Tattered Florals die. 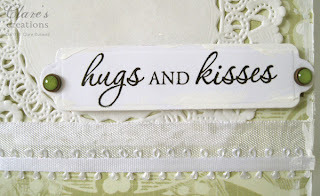 I finally got my hands on some small doilies, you'll be seeing them a lot on my cards... I'm a bit addicted! The sentiment is from Sweethearts by Waltzingmouse Stamps stamped on a Spellbinders double ended tag. I added a little white seam binding and picot edged ribbon. I pretty much edged everything in some white acrylic paint, I love how it makes everything pop more. I like how fresh this card looks. I'll be back tomorrow with my card for the Waltzingmouse Sketch Challenge! Enjoy the weekend! I've still loads of work to do!! Your stuff is SO BEAUTIFUL!!! Thank you so much for all your inspiration! Wow, this is a beauty!!! A stunning card love it !!!! OMG Clare; another jewel from youadded to my favorites folder....Wow! I love every piece and bit of this card! 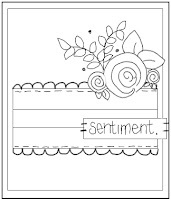 I hope I remeber it well; have a lot of fun with your class tomorrow! 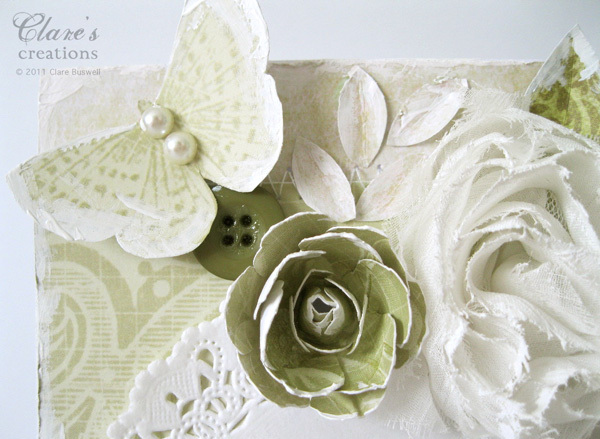 Another fabulous card - and it certainly has that fresh spring feel to it. Hi Clare, I left a comment earlier but it's not showing. I think my computer is playing up. Beautiful card! 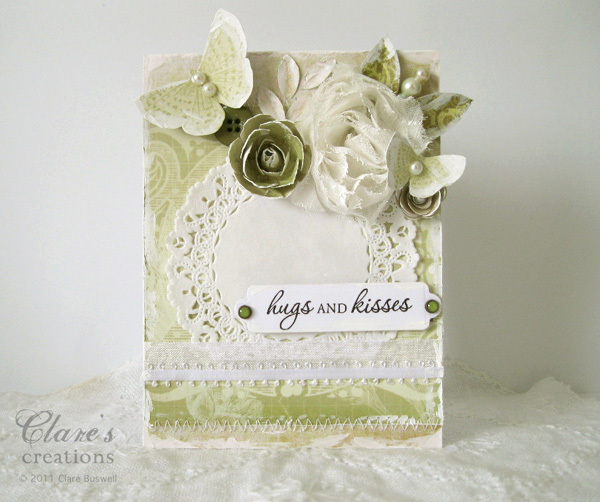 I made a card today all in the spring green tone, too.